The “ISIS” Islamic terrorists have literally CRUCIFIED people in Iraq recently, and have marked the houses of Christians (and Shia Mulsims) – presumably for execution. The ISIS terrorists are not only beheading Christians, but they are systematically beheading CHILDREN. The Sunni rebels [these are the Islamic terrorists beheading Christians] are supported by the Islamist rulers of Saudi Arabia, Qatar and Turkey, as well as the U.S., France, Britain and others. “Over the last two and a half years, Kuwait has emerged as a financing and organizational hub for charities and individuals supporting Syria’s myriad rebel groups,” the report said, adding that money from donors in other gulf nations is collected in Kuwait before traveling through Turkey or Jordan to reach the insurgents. Most of the Syrian “rebels” are Al Qaeda. The U.S. government has designated these guys as terrorists. Things are getting worse, not better: Al Qaeda is gaining more and more power among the rebels. The U.S., Saudi Arabia, Qatar and Israel have been backing these guys for years. Indeed, we’ve long known that most of the weapons we’re shipping to Syria are ending up in the hands of Al Qaeda. And they apparently have chemical weapons. Most of those arms have now ended up in the hands of ISIS. And the Jihadist credited with being the “military mastermind” of the recent ISIS victories is Tarkhan Batirashvili. He’s not Arabic, but rather Chechen. He doesn’t look like an Arab at all Arabic: he’s got a long red beard. Who are Chechens? Their country – Chechnya – was part of the Soviet Union. After the USSR broke up, the Chechens launched wars and terrorist attacks to try to gain independence from Russia. As shown below, the U.S. has been backing Islamic terrorists as part of its geopolitical struggle against Russia for many decades. Question: The former director of the CIA, Robert Gates, stated in his memoirs ["From the Shadows"], that American intelligence services began to aid the Mujahadeen in Afghanistan 6 months before the Soviet intervention. In this period you were the national security adviser to President Carter. You therefore played a role in this affair. Is that correct?Brzezinski: Yes. According to the official version of history, CIA aid to the Mujahadeen began during 1980, that is to say, after the Soviet army invaded Afghanistan, 24 Dec 1979. But the reality, secretly guarded until now, is completely otherwise Indeed, it was July 3, 1979 that President Carter signed the first directive for secret aid to the opponents of the pro-Soviet regime in Kabul. And that very day, I wrote a note to the president in which I explained to him that in my opinion this aid was going to induce a Soviet military intervention. Ramzi Yousef was not only the mastermind of the 1993 World Trade Center bombing, but also a key member of the Bojinka Plot … the blueprint for 9/11. And see this. Whatever it’s origins, you would think – at the least – the U.S. hammered Al Qaeda after 9/11. But NBC News notes that the U.S. allowed an airlift of Al Qaeda out of Afghanistan in 2001. And several high-level U.S. government officials claim that the U.S. intentionally let Bin Laden escape from Afghanistan. We noted above that Saudi Arabia is backing the ISIS terrorists. The Saudi monarch is one of the most brutal dictatorships in the world, and yet the U.S. has been heavily backing it for decades. The Saudis back the most extreme strain of Islamic terrorism, and may well have backed in the 9/11 hijackers And see this. The U.S. also heavily backs the other supporters of the ISIS terrorists, including Qatar, Jordan, Kuwait, the United Arab Emirates, and Turkey. In other words, we back direct sponsors of terrorists. 57 years ago, the U.S. and Britain approved the use of Islamic extremists – including the Muslim Brotherhood – in Syria. According to NBC News, the U.S. and Israel are supporting terrorists in Iran. And the U.S. intentionally armed Al Qaeda in Libya. Our backing of Sunni extremists in Libya led to attacks on our embassies in Libya and Tunisia. In fact, Obama signed a special exemption to the law barring arming of terrorists. 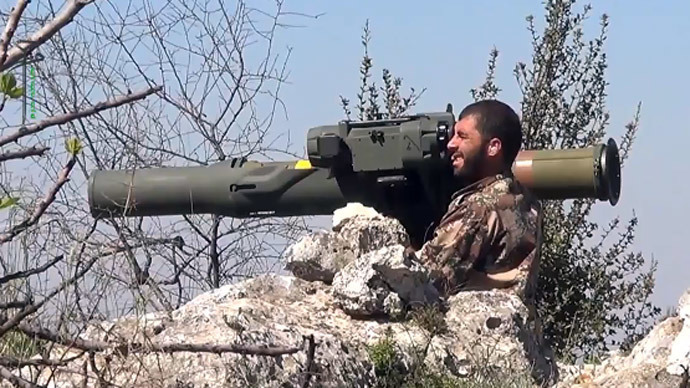 Screenshot from Youtube video showing Syrian Islamic extremist using a TOW provided by the U.S.
Postscript: A former high-level Al Qaeda commander has repeatedly alleged that ISIS works for the CIA.